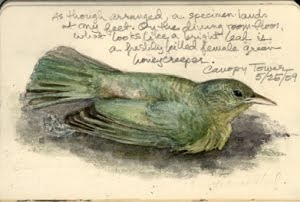 Debby Kaspari of "Drawing the Motmot" photographed during one of many Oklahoma road trips the blogger and artist have enjoyed. A major Oklahoma museum just debuted an extraordinary new exhibit designed to celebrate the creative adventures of an outrageously gifted local artist and naturalist. I want to join in that celebration by toasting that artist and the special friendship that has made my journey back home absolutely remarkable. In August of 2007 I sat on the porch of my new Oklahoma home on the first full day of my new Oklahoma life after 25 years away and watched the postman make his way up the sidewalk with nothing less than resolute determination. Resolute all you want Mr. Postman - that mail is not for me. He shoved a postcard into my hand addressed to the previous owner and rushed off in a way that made certain I'd be responsible for the forwarding. 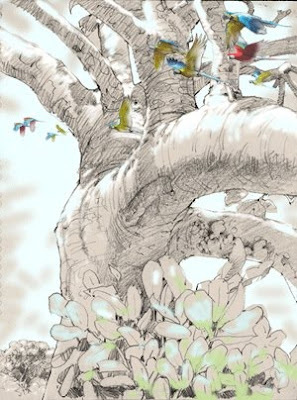 That misdirected postcard was a beautifully rendered announcement of a forthcoming art opening in my neighborhood and on the cover was the most divinely illustrated bird. Little did I know in that moment, still ripe with trepidation at my prompt decision to leave New Mexico, what incredible good fortune would unfold from that errant piece of mishandled mail. I was not only mesmerized by the artist's work -- but also thrilled that a gallery in my new neighborhood in my new life was celebrating the work of a nature artist. Perhaps some of those 250 galleries I had at my disposal in my previous life would not be missed after all. I hugged the card to my chest and smiled at this unintended gift that I was convinced was an omen of good things to come and, at the same time, wondered who this fantastic artist was on the backside of the card. 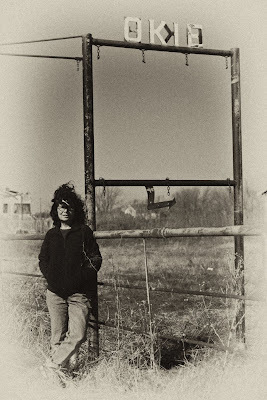 Portrait of the Artist on the Salt Flats of Selman Ranch in Harper County by TR. 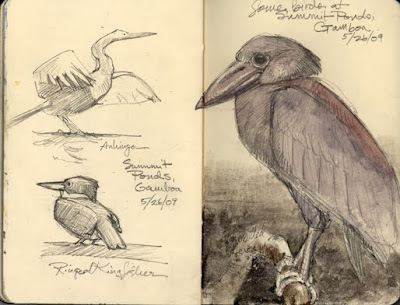 The artist was Debby Kaspari and I soon discovered she also wrote a terrific blog called "Drawing the Motmot". Unfortunately out of town work commitments kept me from attending the postcard's promised "Passionate Menagerie: Light, Form and Function" but in that wonderful way that life often works -- our paths seemed to cross a dozen ways and in no time at all I found myself sitting in her Norman studio savoring the magnanimity of her creative genius - a meeting long insisted by mutual friend, artist and blogger Julie Zickefoose. Fortunately for me, Julie was right on - and Debby and I became fast friends that day. Almost two years later, I consider our friendship one of the greatest gifts of moving back. The Motmot and The Birdchick on the road with TR at the 2009 Lesser Prairie Chicken Festival in western Oklahoma. Debby was named the featured artist of the festival and I got to tag along and meet the infamous Birdchick and the equally amazing travel writer Sophia Dembling. In short time we took our mutual love for nature and art and travel and creativity off the intertubes and out of the studio and on to the road - from the swamps of southeast's Little Dixie to the magnificent prairies of the northwest -- together we have crossed the state of Oklahoma a dozen directions in car and kayak and each time always in absolute marvel at the beauty of this place we call home. We've chased birds and butterflies and rocks and flowers all through fen and forest - traversing the field with Debby is nothing short of a Master's Class in Natural History. Last fall, by odd coincidence, we anchored two ends of the Peruvian Amazon at about the same time - each pursuing passionate endeavors; like minds, indeed, living right here in central Oklahoma. Over the Top, Amazon Macaws - Pastel and graphite on paper by Debby Kaspari inspired by the macaws at the Tampobata Research Station in Amazonian Peru. Not only is Debby Kaspari a gifted artist who continually racks up an accomplished list of awards and prizes -- she is also a phenomenal writer, a master gardener, a brilliant naturalist, an award-winning blogger and on top of all that - plucks an exceptionally fine bluegrass tune on the banjo. Debby is the quintessential Renaissance woman and she finally received the recognition she so well deserves this weekend when the Oklahoma Museum of Natural History unveiled its newest exhibit: Drawing the Motmot: An Artist's View of Tropical Nature. 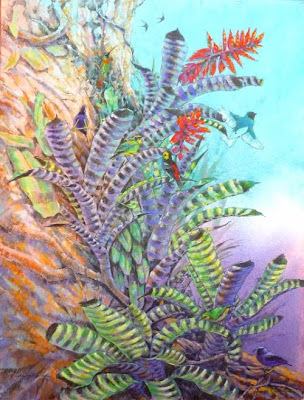 In an unprecedented gesture celebrating a local artist, the Drawing the Motmot exhibit celebrates the culmination of several years of Debby's work in the rainforests of Central and South America. The exhibit recreates Debby's tropical expeditions and is designed to immerse the visitor in "the magical world of the nature artist at work." "The artwork includes sketchbook pages with notes, field drawings, pen-and-ink studies and studio paintings, accompanied by her lively and thoughtful field notes and commentary that give the feeling of a personal conversation with the artist. Adding to the adventure are the sounds of toucans, monkeys and other tropical wildlife recorded in the Amazonian and Panamanian rainforests, plus videos of works in progress in the field." Needless to say I am immensely proud of my friend and hometown girl - this incredible human who speaks the language of birds and participates in life so fully, ripely, deeply. I treasure our friendship immensely and look forward to endless adventures in our home state as we continue to capture this beautiful place on canvas and film. It is fantastic that the rest of Oklahoma will finally get to experience firsthand the incredible measure of Debby's talent at the Oklahoma Museum of Natural History -- starting this weekend and running through January 18. If you are from anywhere near Oklahoma - don't miss it and for more information click here for the link. 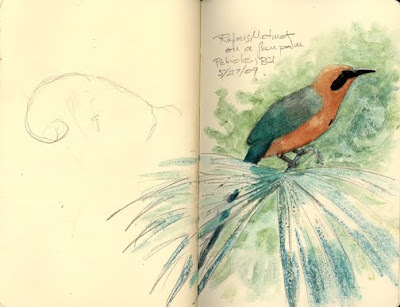 And if you haven't yet come across her award-winning blog - Drawing the Motmot - add it to your list - its always a fascinating visit. 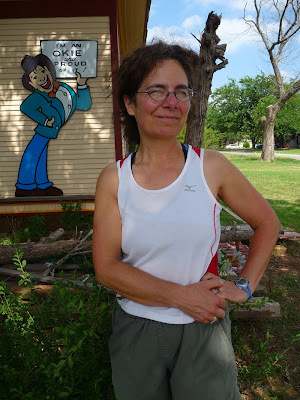 Originally from California, Debby is a proud Okie after 14 years. As I write, I am still on my Great Western Road Trip - birding the soft golden hills and steep canyons of southeast Arizona and wishing my birding and road trip buddy was here with me in this land she also loves. Sadly, there are no Motmots here in this part of the world - which means its time to get home. See you soon. Debbie is an amazing artist/naturalist. How good you two have become friends. I won't be getting to Okie land so I'll just be on my way to check out her blog. Hope you and Kathie are having fun watching birds in Arizona. Great post! Wonderful to see more of Debbie's art, as well as see her getting more exposure and recognition. I hadn't heard the story of how you two meet. I like it! The rational side of my brain believes in coincidence. The rest of the cells vote for fate. Yet another example of how well you let the good come to you! I didnt know that was your introduction to Debbie! No motmots in SE AZ, but maybe you will see a trogan? Not a bad consolation prize. Safe travels. TR, what a wonderful tribute to a good friend and first class artist. Wish I could come and see her wonderful display! She sounds like an amazing person to know. 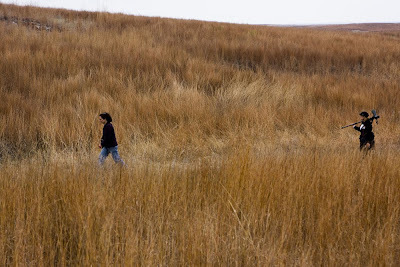 I am a former Okie, (Tahlequah) who loves to great stories like this. Fate most certainly does have a hand in our lives. Thanks for the introduction a a good blog. Not that yours isn't, by the way. 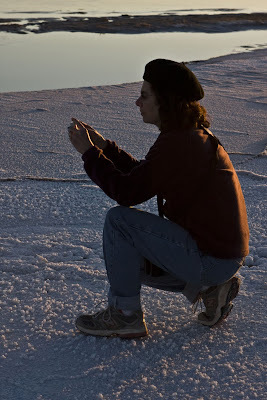 I have been following your southwest trip. After Maine, my husband and I are headed for New Mexico to live. I really love it when bloggers take the time to edit and to use interesting words and to punctuate with images. This is a wonderful piece of writing/imaging. It is also a well-told tale (especially the beginning). It is also a beautiful tribute to your friend. I love her work. I'll never forget the post in which she pointed out that all birds start with an egg shape. That rocked my artistic world. I recently had the chance to meet an avid birder from South Africa by the name of James Currie. He told me birding in Guyana is absolutely fantastic as the rainforest is 80% intact over there! But I'm sure Oklahoma presents many, many opportunities to see rare and beautiful birds as well! As usual, love the photos! Ah, to be feted by TR is to be honored indeed. Your enthusiasm and love of passionate, creative people bubbles over in this post. I had not heard the story of the misdirected invitation but if anyone knows how to listen to the little voice it is you! Hurrah for DK and hurrah for you that you are friends for life.